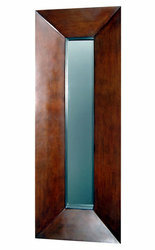 The Alonzo rectangular mirror is a well crafted example of what The Interior Gallery has to offer. The Alonzo's beautiful, substantial frame is constructed of sturdy, solid wood in a sophisticated walnut finish. This impressive mirror is sure to bring about conversation as its large scale design instantly becomes an eye catching focal point in any room.